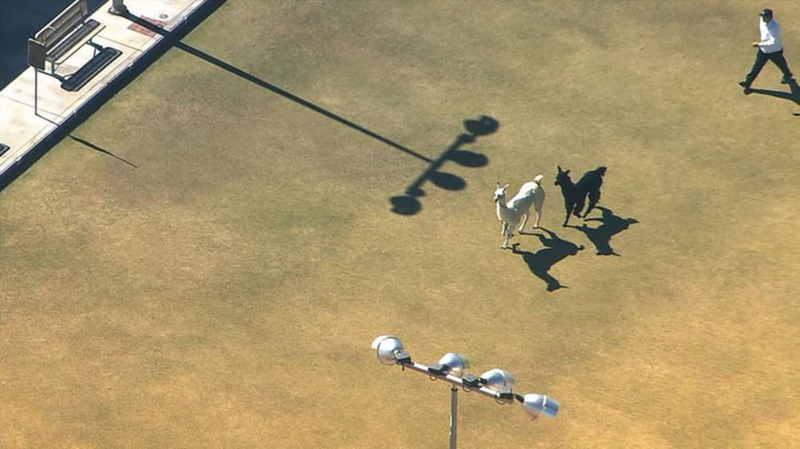 This afternoon, two llamas escaped from a mobile petting zoo and led authorities on a sometimes high-speed, sometimes moseying chase through Sun City, Ariz., for nearly an hour. Here are a few fun facts about the camelids. 2. Llamas are native to the South American Andes. They were first imported into the United States in the late 1800s for display in zoos. In the early 1900s, newspaper magnate William Randolph Hearst brought 12 of the animals to his private zoo at the Hearst Castle in San Simeon, Calif.
4. According to the Pittsburgh Zoo, when one llama has an issue with another llama, it will stick its tongue out to express its displeasure. They’ll also spit on other llamas. 5. The llama gestation period is around 350 days. Baby llamas are called crias, and mothers usually have just one; twin births are rare. 6. Llama dung makes great fuel—and fertilizer. In fact, it may have helped the Incans grow corn and survive in the Andes. 7. Llamas can reach speeds up to 35mph. So let’s hope no more get loose!